Attic ceiling insulation can cut your heating bills by more than just about any other home energy upgrade. In this article we will look at the different choices for attic insulation, from blown to batt, and from cellulose to fiberglass and rock or mineral wool. Before we get to the main topic … a primer on attic insulation and R-values! Attic blown in insulation can be installed much more quickly, by a professional, and can be installed over top of either existing attic blown in insulation or batt insulation, and you don’t have to get dirty yourself. If cost is a real factor for you, you should still consider getting quotes from an insulation company or two for attic blown in insulation, and compare that with your own estimate of do-it-yourself insulation. You may be pleasantly surprised – installed attic blown in insulation is often cheaper than batt insulation purchased from your local building center, and that’s before you’ve installed the batts! 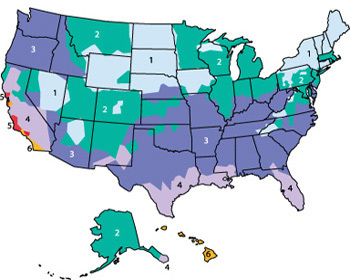 Attic ceiling insulation map for US heating zones. Source: EERE Energy Savers: Insulation. In fact, when you are reinsulating your attic it’s a good time to consider adding ventilation to soffit vents if you do not already have enough (you can never have too much roof ventilation, as long as you don’t let water in!). If you are half-way handy and are having insulation blown in by the pros, nail a few thin strips of wood upright against the joists so that they reach at least 8 inches above the level of attic ceiling insulation you’re paying to have blown in. Then mark the level of agreed insulation (measuring from the top of the ceiling between joists, not the top of the joists) with a red permanent marker, and mark lines two inches above and below that line. That way, you can climb up into your attic when the job is done and check whether the installer got the correct level of insulation. If there are a few areas that are below the red line, don’t worry too much as long as they aren’t below the lower black line. These markers will also remind your installer to do a thorough job – when they know their work is being measured, they tend to be more careful. See note below on vermiculite – I do not recommend using it anywhere in your home. Vermiculite is a naturally occurring mineral which expands into a very lightweight material when heated. Vermiculite pellets were commonly used to insulate attics until the 1990’s. Vermiculite was thought to be harmless, and indeed in its pure state there are no health risks posed by vermiculite. However, one of the main mines where vermiculite was mined until 1990 was a mine near Libby, Montana, which also contained a natural deposit of asbestos. As a result, vermiculite from this mine became contaminated with asbestos. The mine was shut down and current sources of finished vermiculite are low in contaminants. However, due to both the low R-value of vermiculite compared to other blown or batt insulation, and to ongoing concerns about contamination (even at low levels), I would suggest avoiding it altogether. Zonolite insulation, a brand manufactured by W.R. Grace & Co until the early 1980’s, is one type of attic insulation made from vermiculite. Zonolite insulation originated from the Libby mine, but the manufacturer claims that its manufacturing process removed most of the asbestos fibers and that the resulting product posed no significant health risks. Zonolite insulation was discontinued for economic reasons only. However, there are an estimated 15 to 35 million homes in the US with Zonolite insulation installed in their attics or walls. As a result of a class action lawsuit against W.R. Grace, homeowners with Zonolite insulation installed can apply for a rebate of 55% of removal and remediation costs of the insulation, provided the work is done by certified professionals, up to a maximum rebate of $7,500. If you do have Zonolite insulation or other vermiculite attic insulation installed already, do not disturb it and avoid going into the attic at all. You are unlikely to experience any health issues if the insulation is left in place undisturbed and you stay out of the attic. The real risks come when you breathe the attic air or disturb the vermiculite attic insulation by entering the attic. If you are unsure whether you have asbestos insulation in your attic, see the information at the Asbestos network on How to check for asbestos in my home. Although you can gather samples to send in for testing for asbestos content, even the act of gathering the insulation sample can be hazardous so read up first. If you need to do a ceiling renovation that requires insulation to be moved or removed, hire a licensed asbestos insulation removal company to test, and if necessary remove, the vermiculite attic insulation. Asbestos is an extremely toxic compound whose ill health effects can take years or decades to show up. I think it is really interesting that the better the insulation is the longer it takes the heat to escape the house. Heating a house is expensive. I will definitely look into getting really good insulation for my new house I am building next spring. Thanks for the information! I agree with your point of view . definitely like any other method of insulation this probably would be the most efficient way of saving on your electric bill. Great info clearly explained. Thank you so much!! !